In my previous essay, The Resurrection is Technological, I explored Paul’s argument in 1 Corinthians 15, that the resurrection is about God’s intention for humanity to reign over the cosmos. According to Paul, God’s plan was for humans to rule the universe, and if humans failed to do so, God would not abandon his plan, but would become human to insure its completion. This is the reason for the incarnation. For Paul, Death is the ultimate obstacle to humanity’s God-intended reign. And because God had ordained for humanity to reign over the universe, humanity would have to defeat death. This is the reason for the resurrection. Thus, as Paul sees it, the resurrection is not simply an isolated future event. It is virtually synonymous with the unfolding reign of Christ, stretching from Christ’s own individual resurrection, up through the final defeat of death itself. In the previous essay, I emphasized that this reign is participatory. Christ does not come to remove humanity’s God-ordained reign, but to restore it, embody it, and invite us into it. This is the whole point of the New Testament. Christ never intended to reign alone. Christ’s triumph was in “bringing many sons and daughters to glory” (Hebrews 2:10). Christ’s glory is that others will be transformed to be like him (Romans 8:29). Christ’s reign is a reign we are called to participate in at all levels, even up to and including the apocalypse itself (1 Corinthians 6:3; Revelation 2:26-27; Revelation 20:4). “Don’t you know that we will judge angels?”, Paul exclaims in 1 Corinthians 6:3. This participatory reign of Christ wasn’t merely metaphorical. Paul expected his hearers to reign over cosmic beings, and they needed to be practicing for the occasion. And indeed, resurrection is something Christ invites his followers to practice. Jesus raised several people from the dead in his ministry, and so did his disciples. But Jesus anticipated that this would be even more dramatic in the future. So this is not something we wait around to do. This is something we participate in now, to the extent of our capabilities and gifts. We do it in healing, in caring, in feeding, in blessing. We do it in fighting for someone’s life, in searching for a cure, in seeking to understand the nature of life and death and disease. We do it in remembering and celebrating and grieving. Why must we play a part in this? Why can’t we simply wait for God to raise the dead, and set everything to rights? Why must we fight for our loved ones, and not simply wait for God to return them to us? To understand that, we need to understand why death is so bad. Anyone who tells you otherwise has either not experienced it up close and personally, or is trying to find a way of coming to terms with just how bad it is. It is a tragedy, not simply because someone is gone, but because all the relationships they were part of have now come to a halt. What is the value of life, if not this? What is it we struggle for, fight for, and remember about someone, if not their relationships? What do we live to do? We live to be in relationship—with people, animals, our bodies, the physical world. Most of us want long, healthy, productive and meaningful lives. We want to contribute to others in our community, our society, our family. We want to create new things, and fix old things. We want to share joy and jokes and stories with other people, who will then share joy and jokes and stories with us. Relationships, in the deepest sense, are who we are. We are not atomic, isolated, Cartesian minds—we are deeply intertwined networks of relationships, stretching out to the ends of the world. Death takes all of this away. Christians trust that the dead still exist in some way, and will exist in an even more robust way in the future. Many Christians don’t even think there is any subjective time between death, and the ultimate future that is waiting for us. Our loved ones may fall asleep, and wake up in a glorious world. This might tempt us to think that death is no big deal. If death can be overcome, why mourn it at all? Why not rejoice in our loved one’s short-cut into glorious life? Death is a tragedy that compounds. Relationships compound. The experience you had with someone twenty years ago forms the bedrock of your experience today. If you lived or worked with someone for any significant amount of time, the relationship at the end of that process is inescapably unique. There’s no way to “make up for lost time” in a relationship—the relationship is simply different than it would have been otherwise. So when someone dies, all the relationships they would have been part of are irrevocably changed. That loss grows with each passing day, impacting vast numbers of people, draining increasing amounts of potential good from the world. There’s no obvious way to make up for not having a parent growing up, or not having your partner through the most exciting years of your life. There’s no way to make up for missing hundreds of conversations with your dad or your mom—or your sister, brother, or child. All of that has simply disappeared, and you grow into a different person than you would have been. Death never ceases to be a tragedy. Even if someone is resurrected, we will have lost immeasurable opportunities in between. Even in bringing someone back, we may never catch up with the positive impact they could have had. If God were to resurrect everyone today, it would be a wonderful, amazing thing. It would be an incredible blessing. But it would not make up for the opportunities and relationships we have missed out on. It would not make up for what we have lost. So if the real tragedy of death is to be overcome, perhaps there is something else that has to happen. What could possibly make up for irreversible loss? The only thing I can imagine making up for the loss of relationship—is if that loss catalyzed us to become capable of deeper, broader, and fuller relationship. If loss gave us the opportunity to develop a deeper and fuller capacity for love than we could offer otherwise, then our reunion with our loved ones might not simply allow us to pick up where we left off, but might allow us to rejoin them in a much more profound way. To put it in crude, numeric terms, imagine becoming capable of offering 1,000 years worth of relationship in the space of a year. How might loss provide us with that opportunity? What might happen in the wake of a loss, that would help us grow in this way? I want to suggest that it is our very commitment to participate in the resurrection—our commitment to grieve, heal, renew, work, and hope—that provides us with the opportunity to grow into the kind of people who can love in a much deeper and fuller form. After all, this is exactly what Christianity suggests: we must be conformed to the image of Christ. In some form or fashion, we must die and be raised. And in some form or fashion, we must raise the dead. Only in becoming the image of Christ, can we grow into the fullness of what we are intended to be. Only in becoming the image of Christ, can our love become like God’s love, reaching out to encompass the world. And only that kind of capacity for love can make up for the irreversible tragedy that is death. I’ve been suggesting that biblically, defeating death is a process that is virtually synonymous with the unfolding reign of Christ. It’s something we participate in in all kinds of ways, and no aspect of human life is left out. Everything from eating soup, to photographing the cosmos, ultimately plays a part, becoming an aspect of our living sacrifice. Every time we choose good over evil, or mercy over judgment, we are playing a role in the resurrection of the dead. But if the tragedy of death is to be overcome, there must be specific things that only happen in the wake of someone’s death. There must be specific things that happen when we lose someone—things that help us grow in the ways we’ve been talking about, and help us strengthen our relationship with the person we’ve lost. The first one, of course, is grief. This verse used to perplex me. Why is it good to mourn? Are we supposed to be wishing for bad things to happen? To insist that everything is okay, that nothing is as bad as it seems, that this is “just the natural order”, that “everything is for the best”. Both of these are ways of rejecting reality. One refuses to live in a reality this tragic, the other refuses to believe that reality is as tragic as it actually is. Grief refuses to accept either of these answers. The one who mourns is the one who sees the evil that has happened, and rather than drawing back from it, or pretending it’s alright—recognizes it for the horror it really is. And thus, they mourn. Grief is the simultaneous recognition of the world as it is, and the world as it should be—and the recognition that these are not the same. Grief will bear no trite comfort, no “it’s for the best”, no “this is just the natural order”. Grief is the intense and insistent embrace of reality. When we grieve, we hold together two impossible things: a love for the world, and a refusal to be okay with its horror. Grief exercises the ultimate existential muscle, helping us become stronger and more expansive, capable of experiencing deeper feeling and love—allowing us to share in God’s own perspective. Grief is the heart of change. Grief is the soul of revolution. Grief provokes action—if the world is not as it should be, we must change the world. Blessed are those who mourn, because those who mourn can be comforted. And those who grieve can be filled. The world as it is, and the world as it should be, are poles apart. The ones who see this, and rather than accepting it, choose to participate in the solution—must always mourn. In the wake of tragedy, families and communities often come together. Relationships are strengthened around the loss they have experienced. Relatives who have not talked in years may reunite, friends from different parts of the deceased’s life may connect. People who offer to help out may find themselves drawn into deep relationships with people they might not otherwise have ever talked to. We may discover deep reserves in our friends and family that we never knew were there. We may discover new things about ourselves. In all of this—in grieving someone, and in strengthening our relationships in their absence—we are creating a stronger and more definite relationship with the person we have lost. In grief, we focus our thoughts and memories, we take stock of a person’s impact on the world, we realize they reached far beyond what we might assume. We collect and retell stories about them, we assess and evaluate their impact, we bring together different aspects of their life into a more cohesive picture. We may find ourselves doing things that appear irrational. We may keep things that belonged to them, we may find ways to integrate them into new traditions and experiences, we may talk about what they would have wanted, we may visit their grave and speak to them about what is going on. Much of this may not make sense, under the assumption that the deceased person is truly gone. But if we believe that the person still exists in some way, and will exist in a more robust way in the future—then we are still in a relationship with them. And these things are our way of maintaining and strengthening that relationship. In John’s account of the resurrection of Lazarus, Jesus goes through each of these steps. He weeps, expressing deep grief over the loss that has occurred. He connects with the family and community, strengthening their relationship. He remembers, strengthening his relationship with Lazarus himself. In a moving part of the account, Jesus speaks with Lazarus’ sister Martha, asking her if she believes that Lazarus can be raised. I know he will be raised at the end of time, she responds. But Jesus is not content with this. He wants Martha to see that the resurrection is not just something that happens eventually. The resurrection is already at work. It is in their midst. It is standing right in front of her. Martha sees. And when she does, she has the stone rolled away. And then Jesus calls Lazarus to come out. 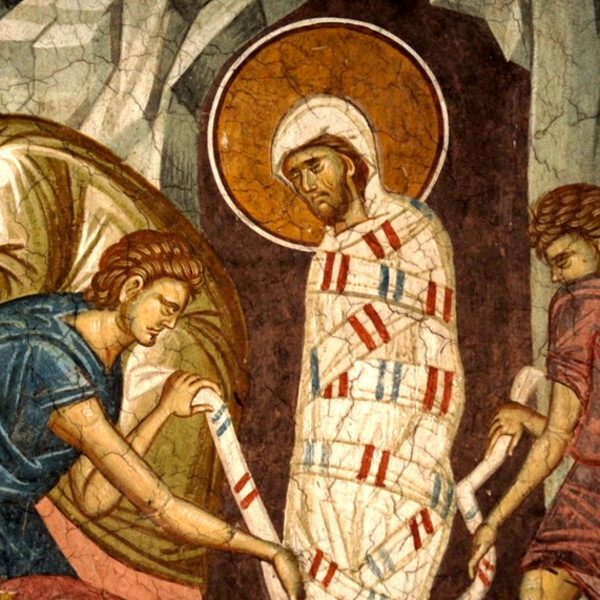 We might think that if Jesus could call forth Lazarus, that he could handle the stone. We might think that Jesus could have skipped the conversation, and just compelled Martha’s faith by moving straight to Lazarus’ resurrection. But this is not how Jesus works. Even in this extreme case, the resurrection is participatory. Martha must have faith that the resurrection is already at work. Then she must take the initiative to roll back the stone. Only then can her voice join with Jesus, calling Lazarus to come forth. In the biblical story, God insists on performing the resurrection through humanity—even becoming human in Christ, in order to insure that this is how it would be accomplished. And according to the scriptures, Christ, as the ultimate human, has been given all power and authority to bring the resurrection about. And yet, he does not do so immediately. The earliest Christians assumed that the ultimate resurrection would come soon, but they did not expect it to be immediate. Paul portrays the resurrection as an unfolding process, in which Christ subdues his enemies gradually. Why? What is he waiting for? Perhaps he is waiting for us. Perhaps participation is intrinsic to the process in a deeper way than we typically think. Perhaps this is shouted from the pages of the New Testament—and we haven’t been paying attention. Perhaps only by grieving, weeping, comforting, remembering, trusting, and acting can we truly become the image of Christ—the kind of people we need to be, in order for the tragedy of death to be overcome. After all, anything less would fall short of the Glory of Christ—because in Christ, everything is participatory. Libertarians and Airport Body-Scans Why I’m a Conservative Fundamentalist Liberal Progressive Feedback Loops What I Would Write Quality of Light Unintended Consequences Aliens among us The Flip Being Human One mind?